﻿Combined Task Force 152 (CTF 152), the Gulf security and cooperation mission of Combined Maritime Forces (CMF), has been commanded by Kuwait since 9 May 2010. Brigadier General Jassim Al-Ansari of the Kuwait Navy assumed command from Colonel Tariq Khalfan Al-Zaabi of the United Arab Emirates in a grand ceremony conducted at Kuwait Navy Headquarters, Mohammad Al-Ahmad Naval Base. This was notable, as it marked the first-ever direct handover of CTF 152 command between GCC member nations. After a successful period in command, which included a programme of maritime exercises and the implementation of a new watch keeper qualification process, General Jassim relinquished command to Colonel Abdullah Dashti, also of the Kuwait Navy, on 9 Aug. 2010. Day-to-day tasking of assets assigned to the task force focused on Maritime Security Operations (MSO) promoting, and if need be enforcing, a secure environment for all aspects of legitimate maritime commerce in the Arabian Gulf. International and regional navies and coast guard forces, including Kuwait, Bahrain, UAE, France, UK and U.S., successfully completed multiple exercises and operations in the Arabian Gulf. These were designed to build upon previous experience and to determine ‘patterns-of-life’ recognition in the Arabian Gulf. ‘Pattern of life’ involves building a complete picture of the maritime environment, such as daily shipping movements and fishing activities, in order to identify behavior that could indicate piracy, smuggling, terrorism or other behaviour of interest. As part of building coordinated proficiency at sea, CTF 152 also conducted a series of exercises designed to enhance maritime command and control interoperability, improve combined planning processes and increase the effectiveness in key mission areas. The first of these exercises was a Maritime Infrastructure Protection (MIP) scenario that included participants from several international and regional navies and coastguards. This year’s event included 14 vessels and support from the Kuwait Navy and Coastguard, United Arab Emirates, Saudi Arabia, Qatar, France, the UK and U.S. It was the third evolution in this series of maritime engagements designed to exercise the establishment of local sea control to protect key economic and energy related maritime infrastructure. During an interview conducted immediately following the exercise, Kuwaiti Brigadier General Mohammed Al-Ansari, Commander CTF-152, explained, “We proved a coalition force can quickly establish local sea control, and more importantly we learned to work more effectively with our regional partners”. The second in an ongoing series of exercises is Goalkeeper – an event designed to flex core capabilities of the MSO mission, and improve those processes that ensure rapid information flow between command centers and the task force. During this evolution, a simulated contact of interest transited the length of the Arabian Gulf while being continuously monitored by coalition forces. Ship position information was shared between Naval Operational Centres (NOCs) to participating naval and coastguard boarding teams standing by to intercept the simulated contact. Participating forces rendezvoused at sea with the vessel, where upon they conducted boarding training to hone skills and share best practices to improve boarding capability. In support of the final core competency, CTF 152 has designed and inaugurated a third key exercise in the series. Khaleje Response is designed to coordinate host country, coalition and U.S. capabilities in response to natural or man made crisis and events, including medical trauma at sea, collisions, and oil spills. Coordination and detailed planning resulted in the exercise occurring between October 25-27, which brought together regional maritime and shore based crisis response entities in a coordinated rehearsal of an oil spill response in the Arabian Gulf. Khaleje Response also reinforced previously established regional hazard response plans while serving as a unique platform to synchronise future efforts in support of both crisis response evolutions and real world events. 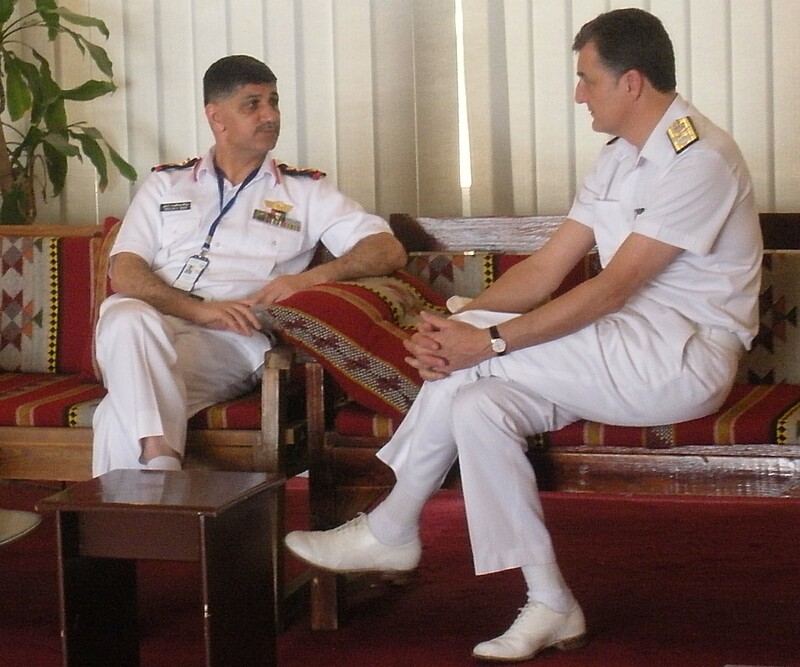 Colonel Abudllah Dashti discusses CTF-152 with CMF Deputy Commander Commodore Tim Fraser. 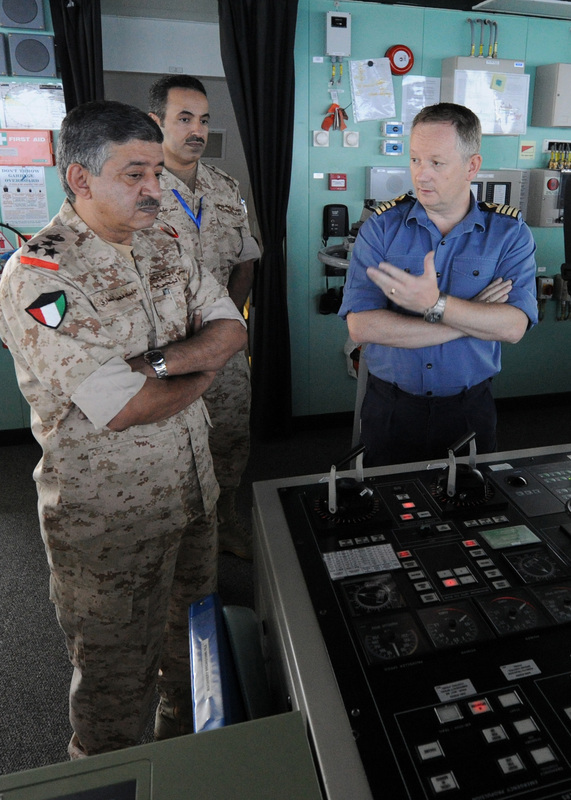 During Kuwait’s command of CTF-152, the Kuwait Navy has launched an initiative to refresh guiding documents, institutionalise procedures, formalise staff duties and invigorate the Battle Watch qualification process. As a result of this combined effort, a significant number of processes were codified and standardised to facilitate better training and improved qualification standards for new staff members. The newly drafted CTF-152 Standard Operating Procedures (SOPs) have been tested through staff embarkations, multi-national exercises and real-world events. The Kuwait Navy’s vision is that all these efforts will assist in the handover of command of CTF-152 to Bahrain later in December 2010.